Nora Cabanilla Takushi, the current president of Binhi at Ani, which sponsors the annual Barrio Fiesta, is a woman who serves her family well, her church with love, and her community with such dedication and enthusiasm. 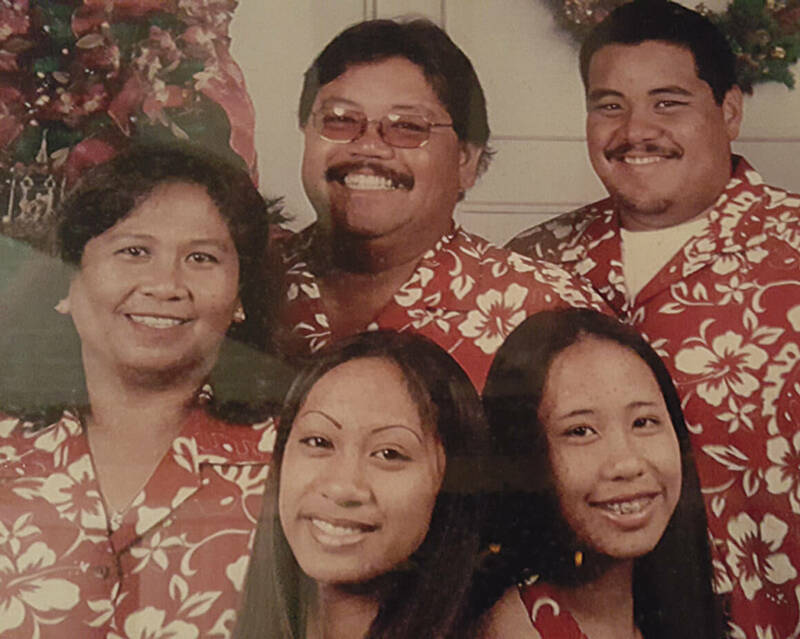 Nora’s uncle, Juan Cabanilla, Sr. was sixteen years old when he first arrived to Hawai‘i. He was the first Sakada generation and shared the opportunity of Paradise with Nora’s father, Florencio Cabanilla. In 1966, Florencio arrived on Maui to labor the fields of Lahaina’s Pioneer Mill Company. 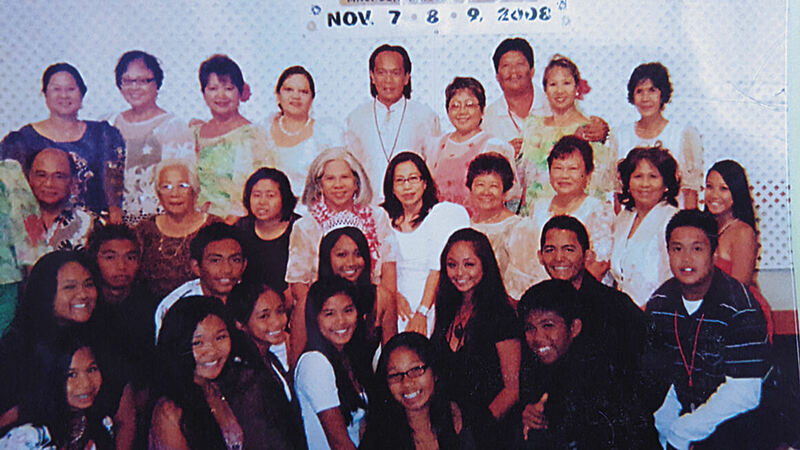 Eight months later, Nora’s older siblings, Felix Cabanilla, Jose Cabanilla Sr., Doris Cabanilla Saribay and Essie Cabanilla Arruiza arrived to live with Florencio. They lived with Juan at Lahaina Pump Camp (Waine‘e Village). Felix worked with Florencio and Juan at Pioneer Mill. 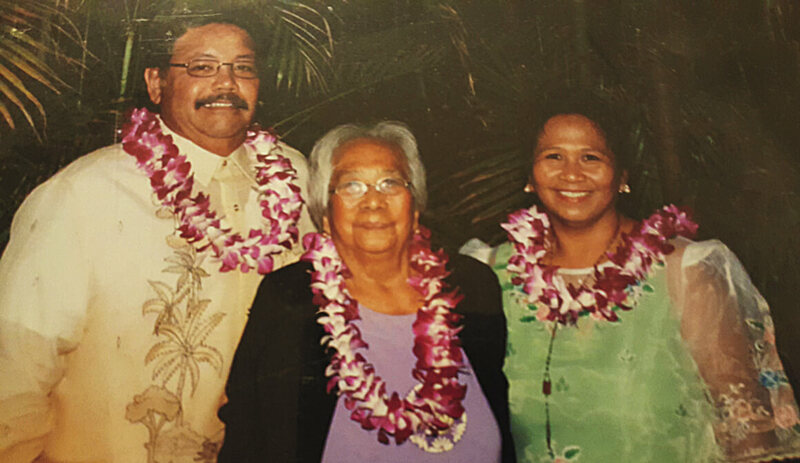 Doris attended Maui Community College, while Jose and Essie attended Lahainaluna High School. 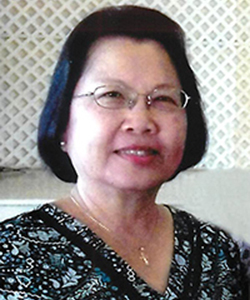 The following year, Nora, who was eight years old, along with her mom Pacita, brothers Ludy and Florentino, and younger sister Leonora Cabanilla O’Brien arrived. Their family was complete and several years later, her sister Leilani was born. Ludy, Florentino and Nora attended King Kamehameha Elementary School. Nora’s second grade teacher was Mrs. Murata, who asked Nora to introduce herself. “I stood up and did as she asked. The kids started laughing at me because of my Filipino accent and broken English. I hung my head with embarrassment.” Mrs. Murata walked over to me and gave me a big hug and said to me, “That is the proper way to introduce yourself. You did a good job, Nora.” Mrs. Murata became Nora’s inspiration to become a Teacher. 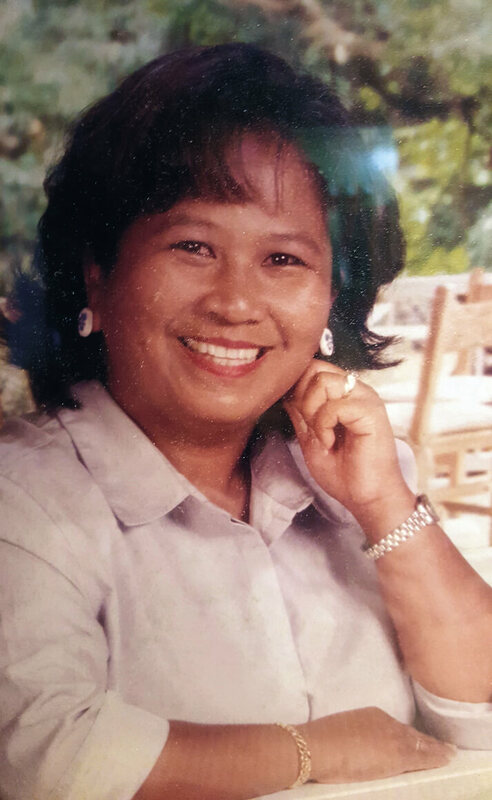 Nora further pursued her involvement in the Maui Filipino Community Council and served as Secretary, Treasurer, and a member of the Board of Directors. She has been involved with the Binhi at Ani for over ten years. 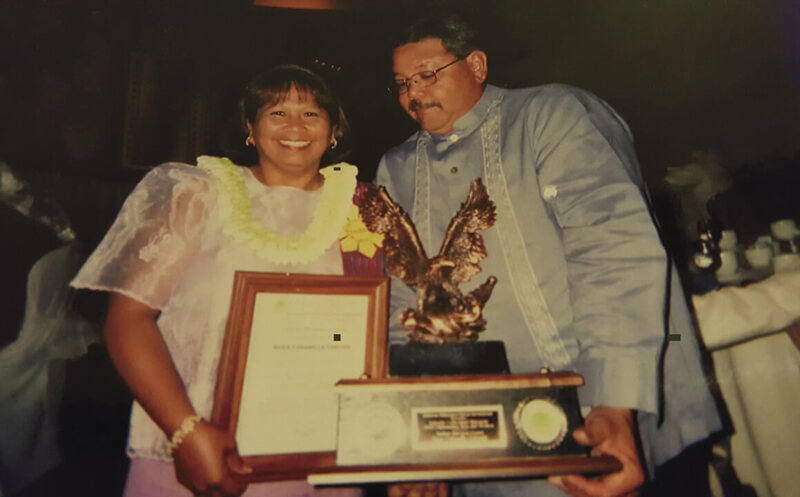 Through her leadership and dedication as president of Binhi at Ani, this year’s Barrio Fiesta will return to its cultural roots, with the hope of sharing the rich Filipino culture with Maui’s residents and visitors. Through it all, Nora remains humble and grounded in her family, community, and church. 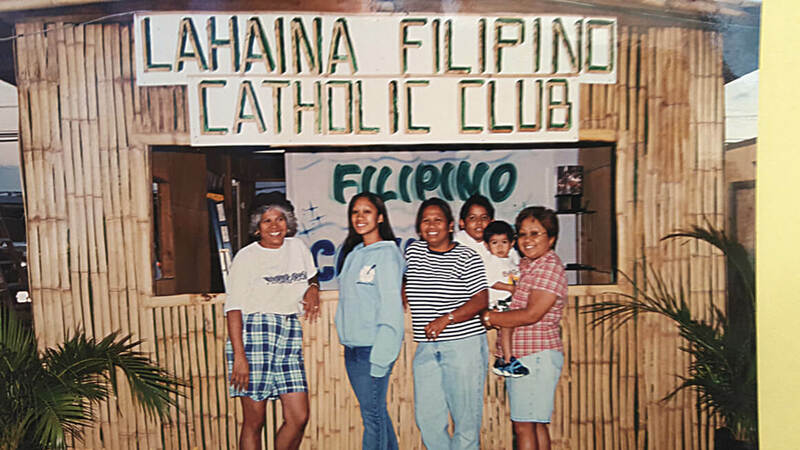 Doris Saribay, Nichole Takushi, Nora Takushi, Max Molina, Ian Cabanilla, & Cora Molina in front of the Lahaina Filipino Catholic Club booth.